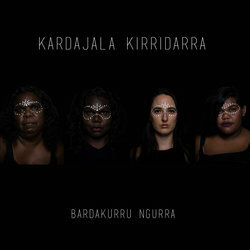 Kardajala Kirridarra were brought together by the Barkly Regional Council’s National award winning ‘Barkly Desert Cultures’ multimedia program aimed at using music and film to express stories and social issues of young people living in the Barkly Region of the NT. It was here that songwriter and vocalist Eleanor Dixon (Rayella, Desert Divas) met Melbourne vocalist, multi-instrumentalist and electronic producer Beatrice Lewis (Beatrice, Haiku Hands). Later joined by key translator, story-teller, poet and Eleanor’s aunty Janey Dixon; and rapper, MC Kayla Jackson, the groundbreaking collective was formed under the moniker of Kardajala Kirridarra, which translates to ‘Sandhill Women’. Kardajala is the name of the mysterious bush woman from the sand hills behind the community of Malinja, NT. Recorded primarily in the intense summer months in a hall in Marlinja NT and produced by Beatrice, Kardajala Kirridarra features sounds from the surrounding lands, such as seed pods, thunders storms and clap sticks made by Eleanor’s father.